What a year 2018 has been for the Long Island Ducks! From a record-setting 27-run performance in the Home Opener to Bethpage Ballpark hosting the Atlantic League All-Star Game for a third time ever, to a 13th postseason berth in team history and a third consecutive Liberty Division Championship, there were an unbelievable amount of memories created this past season. While the year did not have the storybook ending of an Atlantic League Championship as everyone had hoped, there was a lot to be proud of, both on and off the field, in 2018. The organization detailed many of those in its 2018 Season in Review, which can be read by CLICKING HERE. The unanimous selection for the 2018 Ducks Player of the Year was infielder Jordany Valdespin. He was voted by fans as the Delmonte-Smelson Team MVP and will surely be in the running for Atlantic League Player of the Year as well. The former Major Leaguer finished just .0007 points behind Somerset’s Craig Massey for the league batting title but played in 26 more games than him. Valdespin did lead the Atlantic League in hits (154), runs (94) and triples (7) while ranking second in total bases (222) and on-base percentage (.399), third in stolen base percentage (.857) and fifth in slugging percentage (.487). He did not slow down in the playoffs either, posting a .366 batting average while tying for the league-lead in runs (9) and hits (15). Valdespin was selected to play in the All-Star Game at Bethpage Ballpark in July and posted the league’s longest on-base streak of the 2018 season (32 games, June 4-July 14). The starting rotation saw its fair share of names come and go due to injuries, personal reasons and performance. The one constant though was Jake Fisher, and that is one of the reasons why this honor goes to him. Fisher’s eight wins on the year ranked second on the team to only John Brownell (9), and his 3.92 ERA was good for eighth in the Atlantic League. He totaled the fourth-most strikeouts (107) and fourth-most innings pitched (133.1) in the league this year while walking just 25 batters in his 21 games started. Fisher was especially dominant against the teams he would go on to face in the postseason, going 1-0 with a 0.56 ERA in two regular season starts against the Somerset Patriots and 3-1 with a 0.67 ERA in four regular season starts vs. the Sugar Land Skeeters. The southpaw stayed dominant in the postseason, going 1-1 with a 2.89 ERA in three starts, allowing three runs or less in all three, and striking out 13 batters in 18.2 innings. Though he took the loss in the decisive Game Five of the Atlantic League Championship Series, there is no denying Fisher’s first full season with the Flock was a successful one. It is not often you see a player with 16 years of Major League experience, six MLB All-Star Game selections and a World Series championship pitching in the Atlantic League. However, Francisco Rodriguez brought his accolades to Long Island in April of 2018, as he sought an opportunity to get back to the big leagues. While that did not happen this season, “K-Rod” stuck with the Ducks all season long and turned in an impressive season out of the bullpen. The right-hander recorded the second-most saves in the Atlantic League this year with 27, second only to Sugar Land’s Felipe Paulino (33). His 44 appearances ranked third among Ducks in 2018, trailing only Dennis O’Grady (52) and Ashur Tolliver (49), and he compiled a 2-1 record with a 2.76 ERA and 42 strikeouts over 42.1 innings of work. Opponents batted just .196 this season against the pitcher with the fourth-most saves in MLB history. 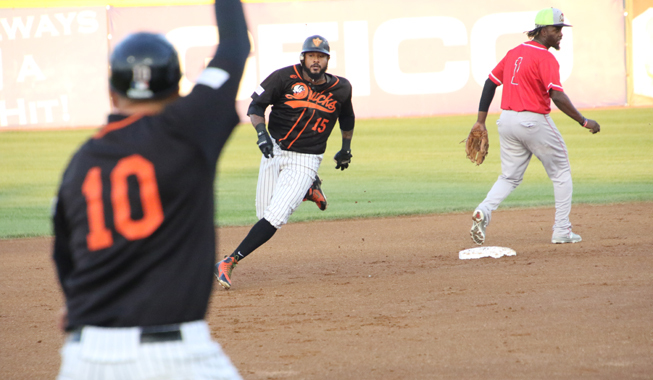 Rodriguez’s year was capped off by working around a leadoff double in the ninth inning of Game Five in the Liberty Division Championship Series at Somerset to force extra innings, a game the Ducks would go on to win 3-2 to claim their third consecutive Division Championship. Several Ducks players showcased strong defensive skills during the course of the season. However, we at “Quack of the Bat” are not sure any dazzled quite as often as outfielder Daniel Fields. The first-year Duck played 90 games in the outfield during the 2018 season and committed just three errors all season, good for a .986 fielding percentage. Additionally, his nine assists ranked fourth in the Atlantic League among outfielders, trailing only the Road Warriors Jorge Fernandez-Diaz (16), Lancaster’s Darian Sandford (11) and Sugar Land’s Anthony Giansanti (10). Fields showed outstanding range and a terrific break on the baseball, especially in center field after taking over in that spot every day following the departure of Emilio Bonifacio. While shoulder troubles limited the amount of games Fields could play defensively, he was unquestionably one of the top outfielders when he could take the field. This award recognizes a Ducks player that great excelled in his first season as a member of the Flock. Taylor Ard was certainly one of the Ducks top acquisitions during the 2018 campaign. Joining the team at the end of May, Long Island was looking for a boost in the lineup. Ard was able to provide that, launching 16 home runs and driving in 61 runs over 95 games played. He recorded a .271 batting average, 98 hits and 20 doubles as well, giving the Flock a big bat in the middle of the order. The 28-year-old then brought his impressive bat to the postseason, as he posted a .409 batting average during the Liberty Division Championship Series, collecting nine hits, two RBIs, four runs and four doubles to lead the Ducks past the Patriots. While he ultimately had to depart prior to the Atlantic League Championship Series for the birth of his child, Ard made a strong impression on the Ducks while with Long Island and was instrumental in their second half/postseason success. For this honor, we highlight which member of the Ducks opened eyes and impressed the most after joining the team. This year, the honor goes to pitcher Bennett Parry. 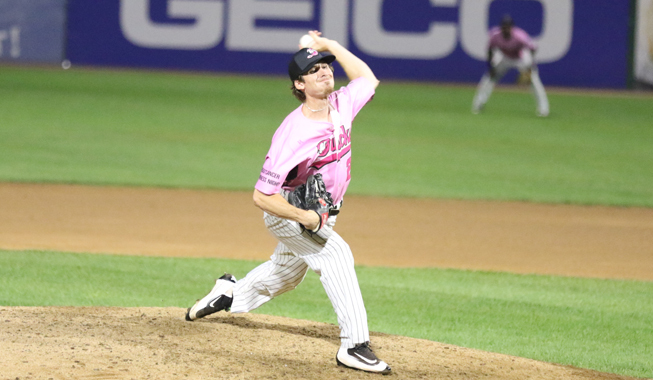 The left-hander began the season as the sixth starter in Long Island’s rotation, and he got off to a somewhat shaky start by yielding four runs over five innings at Somerset in his first outing of the year. However, from that point on, Parry was stellar. The 27-year-old allowed three runs or less in 12 of his 13 starts from that point on and gave up one run or less in eight of those starts. He was also the true definition of a strikeout artist. Despite not boasting a high-velocity fastball, Parry struck out 116 batters in 85 innings of work with the Flock. To give you some perspective, that total still ranked second-most in the Atlantic League for 2018, despite the fact that Parry made only 14 starts and departed on August 2nd after his contract was purchased by the Chinatrust Brothers in Taiwan. Parry struck out 10 or more batters on six different occasions, including a franchise record-tying 14 on the road in Sugar Land May 30th. Parry was selected to start the Atlantic League All-Star Game for the Liberty Division, and he tossed a 1-2-3 first inning. He finished his inaugural season with the Ducks at 6-1 with a 2.85 ERA. Although everyone on the Ducks roster makes it a point to be active members in the Long Island community, Anthony Vega was selected for this honor by our blog staff. The Patchogue native returned to the Flock following the completion of his collegiate studies at the University of Arizona and made an immediate impact on young ballplayers in the area. Vega was consistently involved with events at the ballpark, including both sessions of the Ducks Kids Clinics, presented by Stop & Shop, and the Ducks Kids Club Day. He also frequently volunteered to sign autographs at the Bethpage Federal Credit Union Autograph Booth prior to Ducks home games and stayed on the field near the dugout after many games to sign for young fans as well. Many youngsters commented during the course of the year how friendly and outgoing Vega was during their interaction with the 27-year-old. New for 2018, we are debuting an award that highlights the player who rebounded best during the year, whether from a tough season the year prior or a difficult start to the current season. For this year’s selection, our blog staff has chosen outfielder and hitting coach Lew Ford. 2017 was a disappointing year for the six-year MLB veteran, as injuries limited him to just 76 games, a .269 batting average and 31 RBIs. Entering the season at the age of 41, his ability to stay healthy and be a big contributor to the lineup were certainly questions that needed to be answered. Boy did he answer them! In the year he turned 42, Ford played in 123 games for the Ducks, finishing second in the Atlantic League to only Lancaster’s Blake Gailen who appeared in all 126. Not only was he a consistent fixture in the lineup, but he also performed admirably. The ninth-year Duck led the league in doubles (33), ranked third in RBIs (73), fourth in extra-base hits (44) and at bats (468) and fifth in hits (137). His batting average increased to .293, and he swatted 10 home runs, scored 68 times and even legged out a triple for the first time since 2015. Ford’s success continued into the playoffs, as he tied Valdespin for the league lead with 15 hits and registered a .349 batting average with a homer, seven RBIs, four runs and four doubles in 10 games. Stay tuned all offseason on “Quack of the Bat” for many other updates from Long Island’s hometown team. We’ll have some feature articles on members of the Flock, news updates, interactive posts and much more as we gear up for the 20th Anniversary Season of Ducks baseball on Long Island! The Long Island Ducks and New Britain Bees continue their three-game series on Wednesday night. This will be the 17th of 18 scheduled meetings between the Ducks and Bees this season and the 57th all-time meeting between the two teams. The all-time series is all tied at 28 games apiece, but the Ducks have a 9-7 lead in 2018. The Ducks own a 17-10 record against the Bees at home and bring a 32-20 second half record to Wednesday’s game, sitting in first place in the Liberty Division by just one and a half games. The Bees are eight and a half games back of the Ducks with a 23-28 second half record. A strong pitching performance and early offense led the Ducks to a series-opening 6-2 win over the New Britain Bees. The Ducks erupted for five runs over the first two innings of the ballgame against Bees starter Kyle Simon. An error that plated Jordany Valdespin and an RBI single by David Washington gave the Ducks a 2-0 led in the first. Valdespin’s RBI triple, Lew Ford’s RBI double and an RBI single from Taylor Ard extended the advantage to five. It stayed that way until the sixth inning when a wild pitch by Ducks starter Brett Marshall scored Deibinson Romero, cutting the Ducks lead to 5-1. However, an RBI single by Cody Puckett in the bottom of the inning restored the five-run lead at 6-1. An RBI single by Angelo Songco in the seventh closed the gap to 6-2, but New Britain would get no closer. Marshall earned the win, tossing six innings of one-run ball, allowing four hits and three walks while striking out seven batters. Simon took the loss, giving up six runs (five earned) on 11 hits and a walk over five and one-third innings with eight strikeouts. Logan Ondrusek and Ashur Tolliver each pitched a scoreless inning of relief to seal the win for the Ducks. Lorenzo Barcelo takes the mound tonight, marking his 10th appearance and third start of the season. Thus far, the 40-year-old has gone 2-0 with a 4.80 ERA since joining the Ducks. Barcelo went four innings in his last appearance, allowing five runs (four earned) on eight hits and three walks in the second game of a doubleheader against the Barnstormers. The Dominican Republic native has played professionally for 18 years, reaching the big leagues from 2000 to 2002 with the Chicago White Sox, tallying 66 innings with a 4.50 ERA. Devin Burke starts tonight for the Bees, bringing in a 3-2 record and 4.07 ERA through 22 appearances and seven starts. The righty is coming off a loss against the Somerset Patriots last Friday in which he gave up five runs (four earned) off of six hits in six innings of work. Burke has been a professional since 2013, spending all four previous years of his life in baseball with the Colorado Rockies organization, peaking at Triple-A. TOP 2: Bees take an early 1-0 lead off a sac fly. BOT 4: Taylor Ard and Ramon Cabrera both go yard to push the Ducks ahead 2-1! TOP 6: Bees score three to take a 4-2 lead. BOT 6: David Washington hits his 23rd homer of the season to pull the Ducks within one! Ducks trail 4-3. TOP 8: Logan Ondrusek strikes out Jovan Rosa to leave the bases loaded and keeps the Ducks within one! FINAL: Evan Scribner strands the tying run at third and the Ducks fall 4-3. The Long Island Ducks and Lancaster Barnstormers will battle in a single-admission doubleheader tonight. This will be the 15th and 16th of 17 scheduled meetings between the Ducks and Barnstormers this season and the 269th and 270th all-time meetings between the two teams. Lancaster leads the all-time series by just two games, 135-133, with the Barnstormers up 8-6 in the 2018 series. The Ducks bring a 29-16 second half record into the doubleheader leading the second half standings by four and a half games. The Barnstormers are six and a half games back of the Sugar Land Skeeters in the second half standings with a 23-19 record, but they hold the first wild-card spot with a 61-44 overall record, three and a half games ahead of the Long Island Ducks. The Ducks’ winning streak came to an end, falling to the Barnstormers 6-2 in the series opener. Lancaster opened the scoring in the first inning on Ryan Casteel’s two-out RBI single to center field off Ducks starter John Brownell. Lew Ford tied the game in the bottom of the first with an RBI single to right off Barnstormers starter Brooks Hall. A three-run top of the third put the Barnstormers back in front at 4-1. A bases loaded walk to Josh Bell and sacrifice flies off the bats of K.C. Hobson and Vladimir Frias did the damage. Trayvon Robinson’s sac fly to center in the fourth and a two-out RBI single by Rico Noel in the seventh extended Lancaster’s lead to five. Long Island closed to within 6-2 in the bottom of the seventh on a two-out RBI single up the middle by Miles Williams. The Ducks led off the ninth with back-to-back singles but could not pull even. Hall earned the win, tossing seven innings of two-run ball, allowing six hits while striking out eight batters. Brownell took the loss, giving up six runs (five earned) on 10 hits and five walks over seven innings with two strikeouts. Chris Pike will start for the Ducks in game one. The righty owns a 6.45 ERA in six appearances (three starts) with the Ducks thus far, allowing 11 runs in 15 and one-third innings of work. Pike earned his first win as a Duck on August 23 after allowing one run through five innings on five hits and a walk, striking out three. The Long Island native was primarily a starter in the Tampa Bay Rays organization from 2014 to 2017, reaching Triple-A last year. The 25-year-old was also a participant in the Ducks open tryout before the season. Jonathan Albaladejo will be on the mound against the Ducks tonight for game one. He brings in an even 7-7 record with a 4.33 ERA over 20 starts. The 6-foot-5 righty faced the Revolution last Wednesday, allowing 12 runs (11 earned) on 14 hits, striking out five over five and one-third innings. Albaladejo pitched at the major league level with the Nationals, Yankees and Diamondbacks, and is a former Atlantic League Pitcher of the Year winner. The Florida native is 1-5 in nine career starts against the Ducks, allowing 21 earned runs in 57 and one-third innings, good enough for a 3.30 ERA against the Flock. Lorenzo Barcelo makes his second start as a Duck in the second game, marking his ninth appearance of the season. Thus far, the 40-year-old has allowed four runs in 11 innings of work, totaling a 3.27 ERA and 2-0 record. Barcelo went four innings in his last appearance, allowing one run on five hits in a 2-1 victory, striking out four. The Dominican Republic native has played professionally for 18 years, reaching the big leagues from 2000 to 2002 with the Chicago White Sox, tallying 66 innings with a 4.50 ERA. Atlantic League veteran Ty’Relle Harris starts game two for the Barnstormers, making his third appearance of the season. The righty has given up six runs (five earned) in his four and one-third innings of work since returning to the league. Harris first joined the league in 2013, spending two seasons with the Bridgeport Bluefish before spending the last three seasons with the York Revolution. Fans can follow all the action for tonight’s games, and every Ducks game in 2018, on the Long Island Ducks Broadcast Network. Live streaming HD video and audio via BoxCast will be available on the team’s official Facebook page through Facebook Live, on the Ducks’ official YouTube channel and at LIDucks.com in the Ducks Video Center on the homepage. In addition to updates in this post, fans can follow a pitch-by-pitch account of tonight’s games via Pointstreak’s Game Live application by CLICKING HERE. TOP 1: Chris Pike retires the first three batters he sees in game one of the doubleheader! BOT 1: Ducks strike first with an RBI single off the bat of David Washington! TOP 2: Barnstormers strike back with three runs in the frame. BOT 2: Jordany Valdespin ties it up with a two-run bomb to right field, then Lew Ford pushes the Ducks ahead with an RBI double! Ducks lead 4-3! TOP 4: Barnstormers tie it up at four after an error brings in a run. BOT 4: Lew Ford gives the Ducks a 5-4 lead with his second RBI double of the game! BOT 5: The Ducks get an insurance run off an error to push the score to 6-4! TOP 7: A three-run homer puts the Barnstormers ahead 7-6 with three outs to go in game one. FINAL: DAVID WASHINGTON STARTS THE FINAL INNING WITH A GAME-TYING HOMER, THEN JORDANY VALDESPIN FINISHES IT OFF WITH A WALK-OFF SINGLE! DUCKS WIN 8-7! TOP 1: Barnstormers strike first in game two with a pair of runs in the first. BOT 1: Miles Williams cuts the deficit in half with a solo home run over the billboards in right field. TOP 3: A Trayvon Robinson homer extends the Barnstormers’ lead to 3-1. TOP 4: Another two runs come across to push the Barnstormers’ lead to 5-1. BOT 5: Cody Puckett sends a solo shot over the left field wall! Ducks trail 5-2. BOT 6: David Washington pulls the Ducks within two with a deep sacrifice fly to center field! Ducks trail 5-3 heading into the final inning. BOT 7: The Ducks tie it up with a two-run single off the bat of Miles Williams! We’re going to extras! TOP 8: Barnstormers tack on two runs in extras to give Lancaster a 7-5 lead. FINAL: Huascar Brazoban shuts down any comeback effort from the Ducks, splitting the doubleheader 7-5.